Ok. As a lawyer this might be a crucial decision for doing a good job. But I think this to be a very inspirational thought to integrate in our every day life. Some time ago I personally decided for myself to not join those endless conversations about age any longer. Because the longer I used to think about growing older, the more important it seemed to be. And since I made that decision to NOT feed this thought with attention anymore, it just vanished. Why talk and discuss or complain about things which just happen to be? Why not just accept them? This might be a good introduction for…tadaa…! 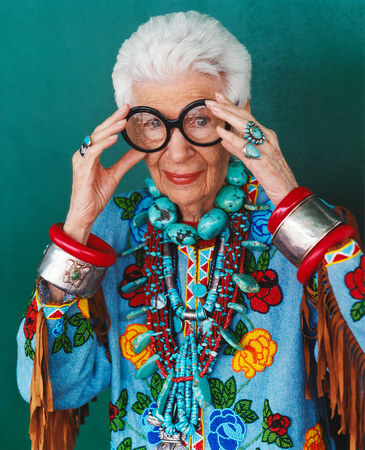 The one and only Iris Apfel, who calls herself a geriatric starlet! She has not only a wonderful unique way of styling herself. Most importantly she´s really being her true self. 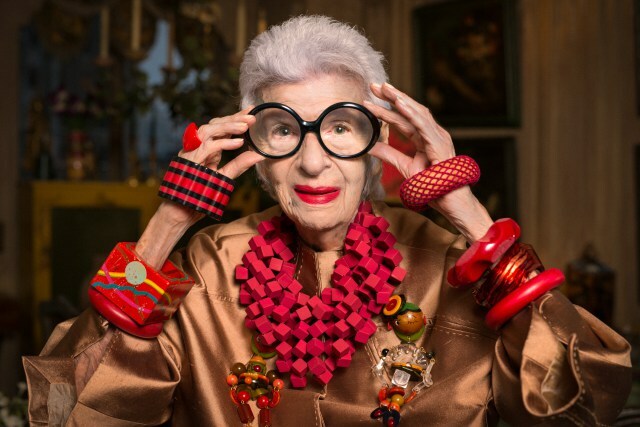 Iris is 94 years old, living in New York and has had a very creative and fulfilling career as an interior designer ( she even worked for the white house!). She came to international fame after her hugely successful exhibiton at the Metropolitan Museum of Art in 2008. People just couldn´t get enough of her and since then adore her as a fashion icon.